bell G3 LG mts Phones Rogers SaskTel videotron LG brings G3 to Canada August 1st! LG brings G3 to Canada August 1st! Oooh, man I can almost smell it. The lasers... the Qi charging... the qHD display. The G3 is going to be an awesome phone, and I know I'll be making my way to a Bell store to pick one up as soon as I can. That date just got official as LG has announced that it will be available as of August 1st at Bell, Rogers, MTS, Sasktel, Videotron and a few other retailers (interesting... no Telus). 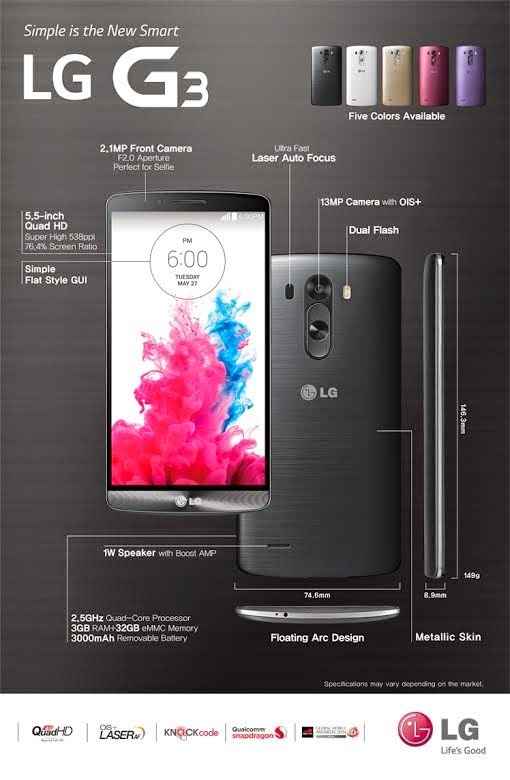 TORONTO, July 3, 2014 — LG Electronics (LG) today announced the LG G3 is coming to Canada through Bell, MTS, Rogers, Sasktel and Videotron, as well as national retailers Tbooth wireless, The Source, WIRELESSWAVE, WIRELESS etc…, and WOW mobile beginning August 1. As a quick run-down, remember, this is the phone with the QuadHD display (2560x1440). Other improvements over the G2 include: removable battery, Qi charging, laser auto focus and a 1 Watt speaker (placed on the back this time). Are you going to nab up this phone?